William Blake (1757–1827), The Stygian Lake, with the Ireful Sinners Fighting (Dante's Inferno) (1824-27) pen, ink and watercolour over pencil, dimensions not known, National Gallery of Victoria, Melbourne, Australia. Wikimedia Commons. 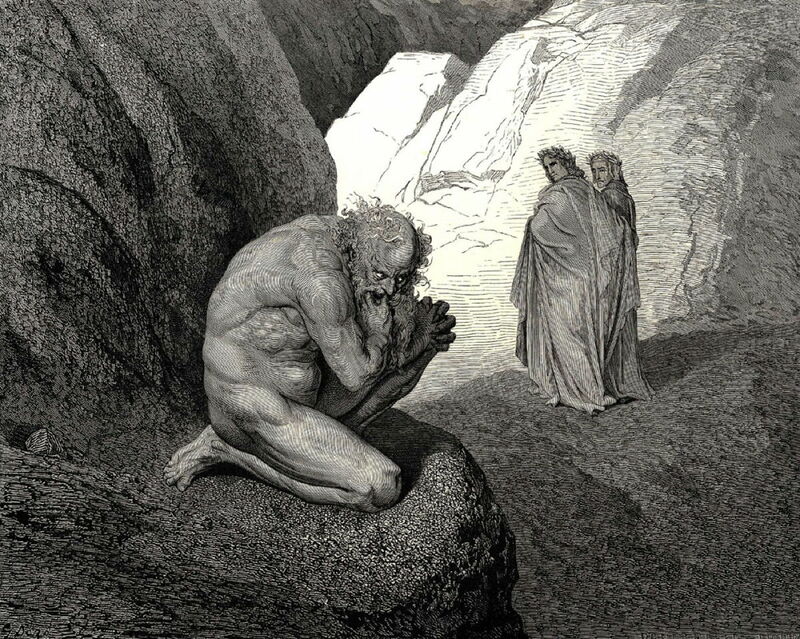 From the gluttons, Virgil leads Dante past the great foe of Plutus, a wolf-like creature who is chided by Virgil, and so they descend to see the next densely-populated circle of avaricious misers and prodigal spendthrifts. 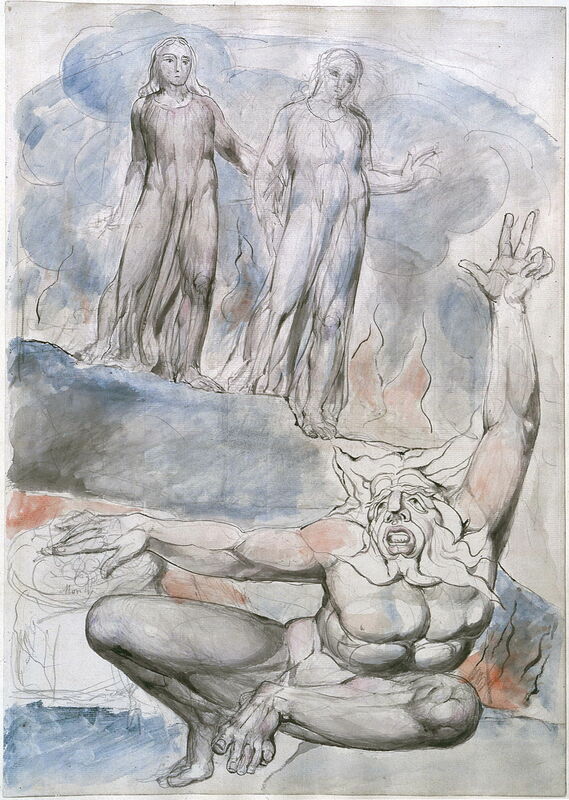 William Blake (1757–1827), Plutus, Dante and Virgil (Dante’s Inferno) (1824-27), watercolour on paper, dimensions and location not known. Image by Meladina, via Wikimedia Commons. Gustave Doré (1832–1883), Plutus (c 1857), engraving, dimensions and location not known. Wikimedia Commons. Plutus most probably refers to a composite of the god of wealth, thus the root of the evil in these souls in the fourth circle of Hell, and Pluto, one of the gods of the classical Underworld. Either of those roles justifies Dante’s description of him as the great enemy of mankind. As opposites, the two groups of spirits are locked against one another, each rolling great boulders around in opposition. When their rocks crash together, they turn about and push in the other direction, and so on for eternity. Among those whose sin is avarice are many clerics, including cardinals and popes. 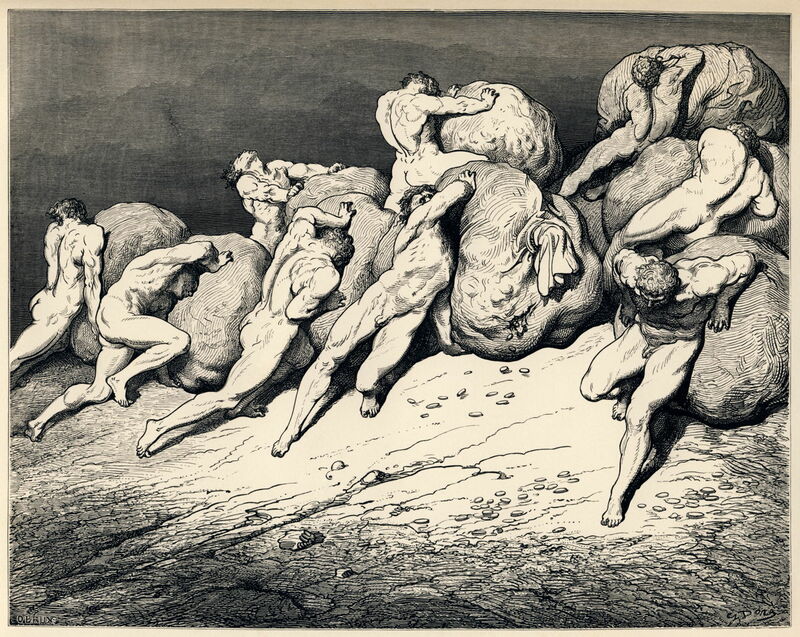 Gustave Doré (1832–1883), Hoarders and Wasters (c 1857), engraving, dimensions and location not known. Wikimedia Commons. Virgil explains the role of Fortune in all this, that neither group of sinners can ever be satisfied with the riches that she has. Thus both the avaricious and the spendthrifts curse the angelic Fortune for their own sins. 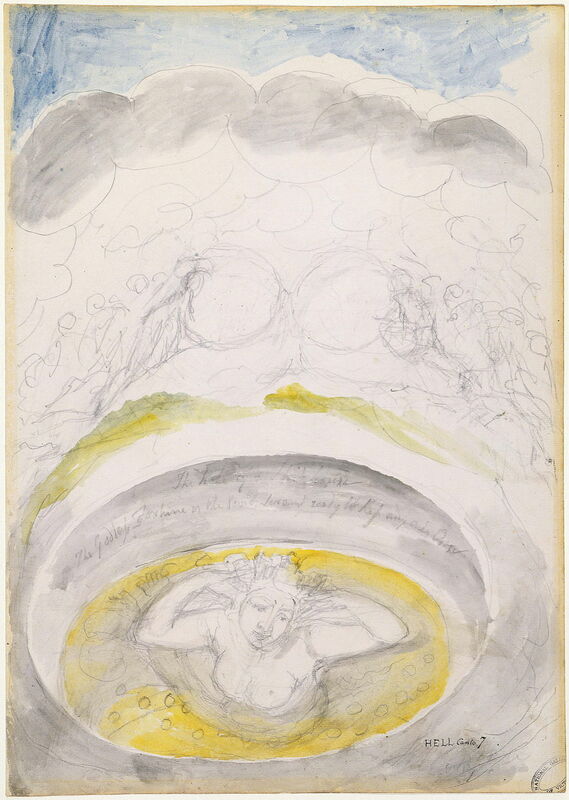 William Blake (1757–1827), The Goddess of Fortune (Dante’s Inferno) (1824-27), watercolour on paper, dimensions and location not known. Wikimedia Commons. 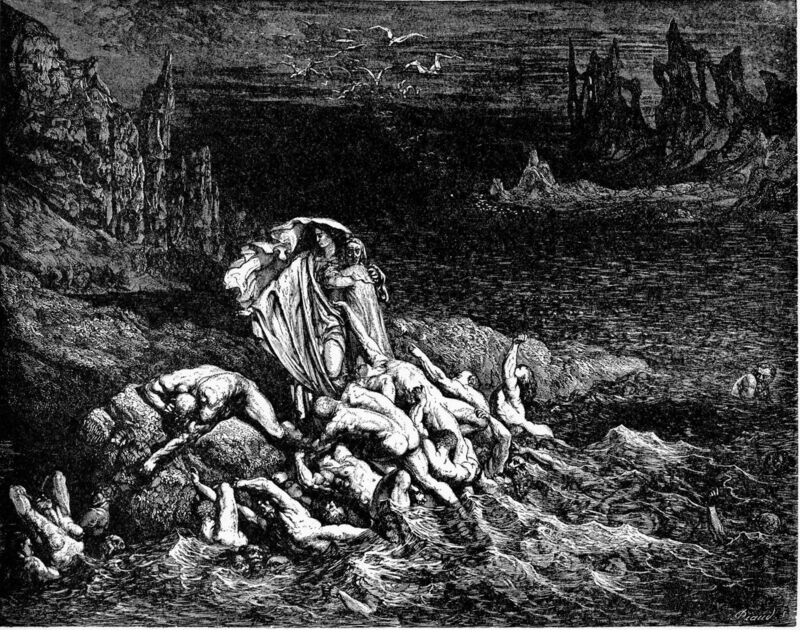 Dante is led by Virgil past a dark spring to the swamp of the River Styx, so entering the fifth circle of Hell, where other souls covered in mud are attacking one another, punching and kicking as hard as they can. These are the sinners who were overcome with anger. Also in the swamp are their complements, the mournful and miserable, whose breath bubbles upwards through the muddy waters. William Blake (1757–1827), The Stygian Lake, with the Ireful Sinners Fighting (Dante’s Inferno) (1824-27) pen, ink and watercolour over pencil, dimensions not known, National Gallery of Victoria, Melbourne, Australia. Wikimedia Commons. Gustave Doré (1832–1883), Virgil shows Dante the Souls of the Wrathful (c 1857), engraving, dimensions and location not known. Image by Karl Hahn, via Wikimedia Commons. The two reach the foot of a high tower, on top of which two flames are lit to signal to another tower in the far distance. This brings them a ferry, this time rowed by a man who Virgil calls Phlegyas, who is to carry the pair across the Stygian waters in his boat. 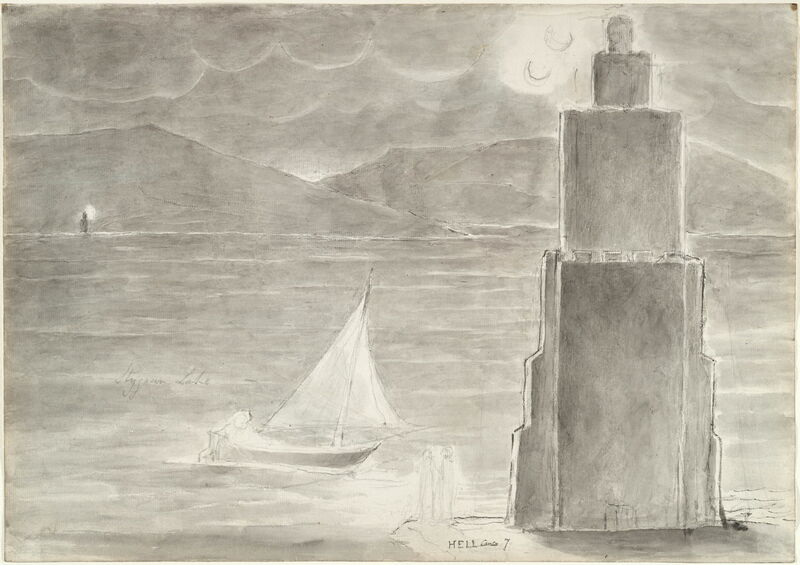 William Blake (1757–1827), Dante and Virgil about to Pass the Stygian Lake (Dante’s Inferno) (1824-27), watercolour on paper, dimensions and location not known. Wikimedia Commons. Phlegyas is a character drawn from classical legend and myth. After Apollo raped his daughter, Phlegyas flew into a fit of rage and burned the temple of Apollo. In punishment, the god killed him. 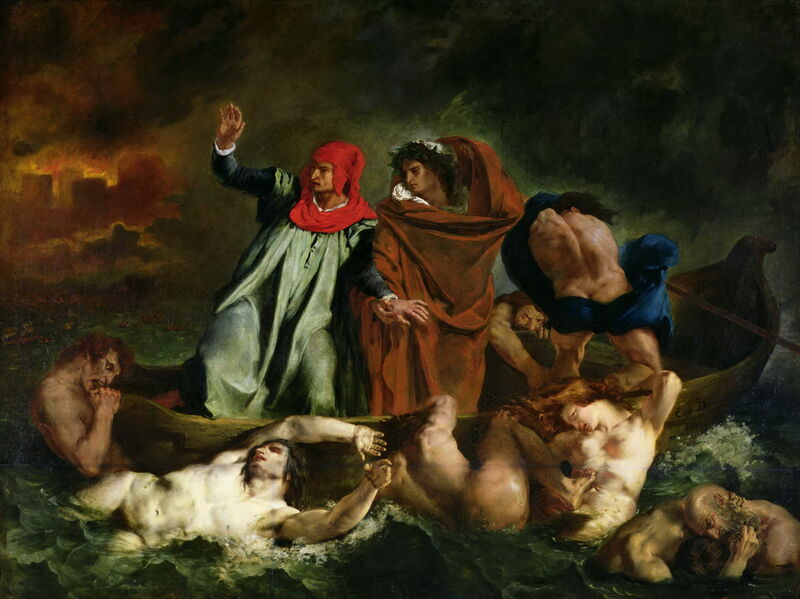 Eugène Delacroix (1798–1863), The Barque of Dante (Dante and Virgil in Hell) (1822), oil on canvas, 189 x 241 cm, Musée du Louvre, Paris. Wikimedia Commons. Rather than showing Charon’s more famous ferry, Eugène Delacroix’s The Barque of Dante may show Dante and Virgil being carried across the River Styx by Phlegyas. As Phlegyas rows Dante and Virgil across rough water, the spirit of Filippo Argenti, an arrogant Florentine who is hated by Dante, rises out of the water and tries to capsize their boat. 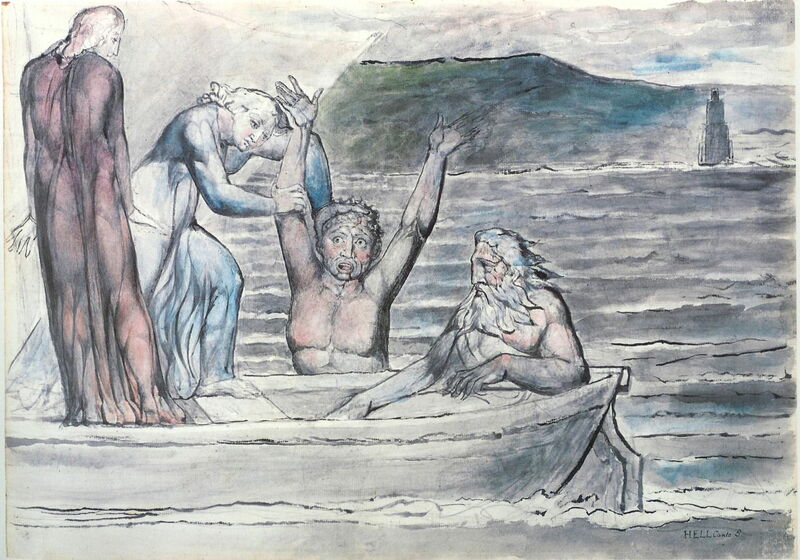 William Blake (1757–1827), Virgil repelling Filippo Argenti from the Boat (Dante’s Inferno) (1824-27), watercolour on paper, dimensions and location not known. Wikimedia Commons. Dante tells him to be off, and Virgil assists in pushing him back into the river. They see Argenti’s ghost cast among those fighting on the shore, where he is torn apart by them, to Dante’s delight. 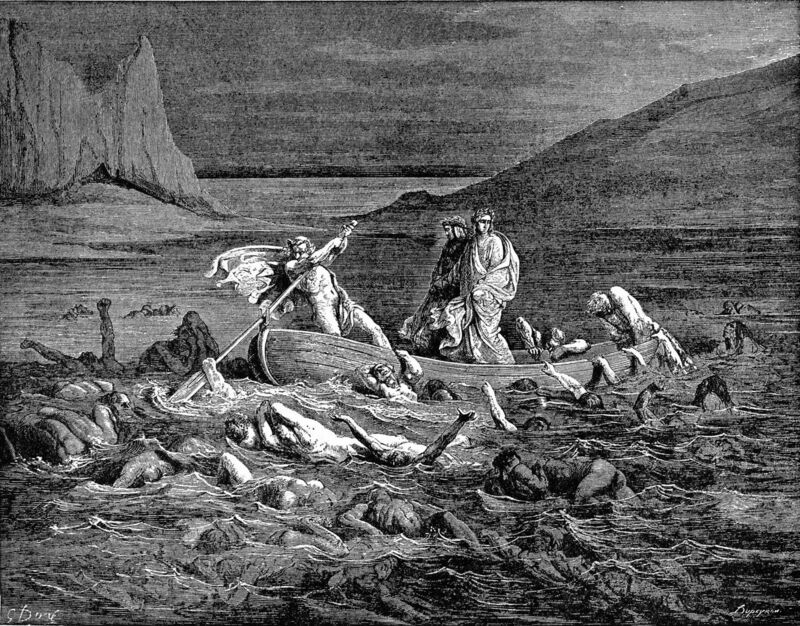 Gustave Doré (1832–1883), Phlegyas Ferries Dante across the Styx (c 1857), engraving, dimensions and location not known. Image by Karl Hahn, via Wikimedia Commons. Their boat approaches the moated city of Dis, in the depths of Hell (circles six to nine). Phlegyas lands them at the city’s entrance. Virgil goes forward to secure their admission, but the gate to the city is slammed shut on him. 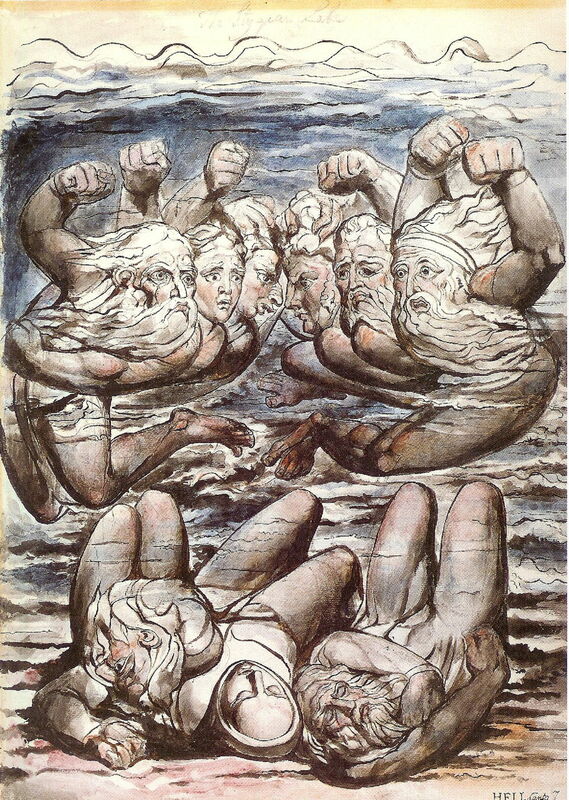 William Blake (1757–1827) was a British visionary painter and illustrator whose last and incomplete work was an illustrated edition of the Divine Comedy for the painter John Linnell. Most of his works shown in this series were created for that, although he did draw and paint scenes during his earlier career. I have a major series on his work here. Eugène Delacroix (1798–1863) was a major French painter whose Romantic and painterly style laid the groundwork for the Impressionists. In addition to many fine easel works, he painted murals and was an accomplished lithographer too. Many of his paintings are narrative, and among the most famous is Liberty Leading the People from 1830. This article looks at some of his narrative works. Gustave Doré (1832–1883) was the leading French illustrator of the nineteenth century, whose paintings are still relatively unknown. Early in his career, he produced a complete set of seventy illustrations for translations of the Inferno, which were first published in 1857 and continue to be used. These were followed in 1867 by more illustrations for Purgatorio and Paradiso. This article looks at his paintings. Robin Kirkpatrick (trans) (2012) Dante, The Divine Comedy, Inferno, Purgatorio, Paradiso, Penguin Classics. ISBN 978 0 141 19749 4. Richard Lansing (ed) (2000) The Dante Encyclopedia, Routledge. ISBN 978 0 415 87611 7. Guy P Raffa (2009) The Complete Danteworlds, A Reader’s Guide to the Divine Comedy, Chicago UP. ISBN 978 0 2267 0270 4. Prue Shaw (2014) Reading Dante, From Here to Eternity, Liveright. ISBN 978 1 63149 006 4. Posted in General, Life, Painting and tagged Blake, Dante, Delacroix, Divine Comedy, Doré, narrative, painting. Bookmark the permalink.